Some exersices on Wh-questions in Present Simple. 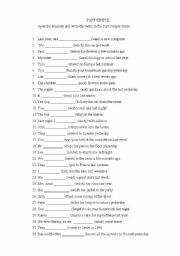 it is a worksheet with explanation and an exercise on 3 prepositions on time: in, at and on. it is a matching exercise on Internet and SMS language. 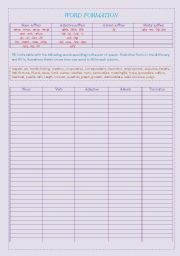 This worksheeet can go together with another work or worksheet on Mobile phones. 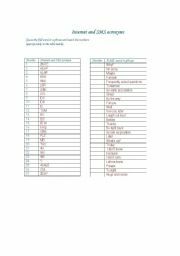 Teach suffixes and parts of speech. Dictionary work. 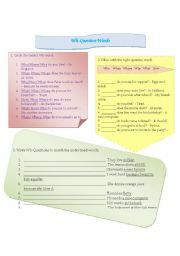 Updated worksheet from the yesterday�s contribution. 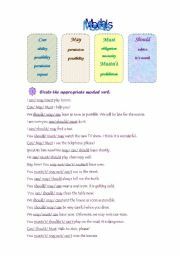 Different exercises to pracrice modal verbs such as can, may, must and should. Sometimes teachers have several marks to give during the lesson, so I created some kind of registry journal which can be used during the lessons. Some other columns can be added like Notebook Check or Test, you can add other ideas. I hope it will be useful. 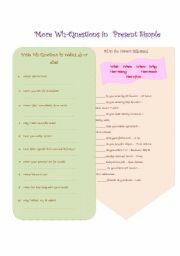 This wirksheet was prepared for drilling Wh-questions in Present Simple but it can be adapted for other tenses as well. The pupils should open the brackets and put the verb in the correct form of Past Simple.